Pioneering joint replacement surgeon Dr. Jeffrey Burns and renowned sports medicine specialist Dr. Thomas Baylis opened the doors to Premier Orthopaedics & Sports Medicine in 2008. Located in Hattiesburg, Mississippi, the joint practice strives to provide the best-individualized patient care possible. Serving patients of all ages throughout Hattiesburg and the greater Pine Belt community, the team offers a full array of options to treat a wide range of musculoskeletal issues, including spinal conditions, joint problems, tendon and ligament issues, dislocations, sprains, and bone breaks. They advocate exhausting all other options before resorting to surgery, including the proper use of medications, physical therapy, and other nonsurgical treatments. However, when these options are ineffective and the need for surgery is evident, the doctors discuss each patient’s individual situation, providing extensive information regarding the benefits and risks involved, details about the actual procedure, and the rehabilitation process after the surgery. The combined orthopaedic expertise and experience of Dr. Burns and Dr. Baylis creates an ideal setting for patients to make informed health choices with confidence. Dr. Burns and Dr. Baylis have successfully treated a wide variety of patients with excellent results. 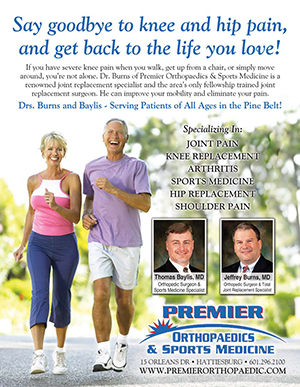 Both of our providers at Premier Orthopaedic & Sports Medicine are expert-trained surgeons in orthopaedics, sports medicine and total joint replacement. 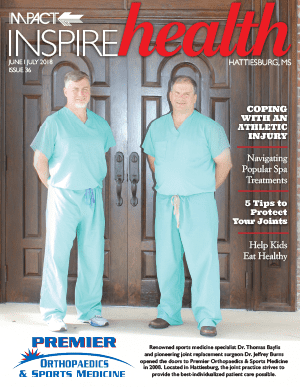 Dr. Burns is the only fellowship-trained joint surgeon in the Hattiesburg area. Dr. Baylis did his fellowship training with Dr. Jimmy Andrews and Dr. Lawrence Lemak in Birmingham. Is shoulder or back pain keeping you up at night? Schedule an appointment with one of our doctors now for an evaluation to prevent further injury! Our orthopedic surgeons specialize in sports medicine and total joint replacement. Schedule your consultation to learn more about sports injury recovery during the off-season. At Premier Orthopaedic & Sports Medicine, we accept most major insurance plans. Here is a short-list of just some of the most popular plans we accept. Please contact our office if you do not see your insurance provider listed. "Dr.Burns did an amazing job on my mom! Thank-you Dr.Burns and the team for all you guys have done to help my mom." "Dr. Burns is the kindest, most compassionate person. Every doctor should have his bedside manner." "I recommend Dr. Burns not only for the excellent outcome with my hip replacement surgery but also his great bedside manner which put me at ease." "Dr Burns provided me with excellent care and I couldn't be happier with my outcome."